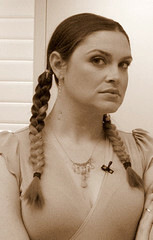 Some of you may know Ariel Meadow Stallings, author of Offbeat Bride, the book and web phenom. She’s also the subject of my current “How’d you land that great job?” column in the Seattle Times, as her part-time day job as a blogger at Microsoft is pretty dang enviable. Following are excerpts from my Q&A with her. The job: “I never thought my silly Internet addictions would actually be useful,” says freelance writer and author Ariel Meadow Stallings, who’s kept a personal blog since 2000. But in the Microsoft job she’s had for the past year, being Facebook-savvy isn’t just useful — it’s essential. As a marketing manager on the software giant’s staffing team, the Seattleite spends much of her time publishing Microspotting, a blog profiling some of Microsoft’s most notable employees, from a Peruvian rockstar to a technical editor known as That Goth Girl to the company’s infamous mystery blogger Mini-Microsoft. I was going to stop reading right then. I wasn’t looking for a full-time job, let alone a job at The ‘Soft. In the late ’90s, I’d worked a contract gig at Microsoft, [doing] content editing, and it was such a bad fit that I was fired after two weeks and literally escorted out of the building. But then I noticed the job was part-time — and permanent. That hit a special and rare sweet spot for me, as I’d have the benefits of a permanent gig (Helloooo, health insurance!) but still have time to work on all my freelance projects. I wouldn’t have considered the job if it had been a 40-hour-a-week position. Q. What does a week in the life of Ariel at Microsoft look like? A. I try to get a new [employee] profile up every week or two on Microspotting, so there’s a fair amount of behind-the-scenes researching and networking that goes on. I’m obsessed with conveying the diversity of Microsoft in my profiles, so I do a lot of mulling over whether I’ve already profiled too many white-dude testers vs. female Indian developers vs. older gay Inuit program managers. I want the stories to stand on their own as interesting and noteworthy, even without the marketing angle. Once I’ve got a person I know I want to profile, I meet with them to record an interview and take a few photos. That’s actually been a surprisingly fun part of this job — somehow I’ve become a corporate photographer. But I try to take unexpected shots of people having fun and being themselves. I’m not into the stuffy head shots. Like any journalist, there’s transcribing and writing up the interview, and then pushing it live on the Web site. I also manage promoting the site — mostly using social media sites like YouTube and the photo site Flickr and the bookmarking site Digg. And I’m managing the development of a Facebook application for my team and helping with the Workin’ it @ MSFT fan page. Q. What advice can you give hopeful corporate bloggers? A. Just blog! And then blog more! And read blogs! And blog more! Blogging for yourself is the best training you can do — especially if you get into the metrics, like your Web stats. Granted, it’s not easy work (there’s nothing sadder than an abandoned blog that hasn’t been updated for 18 months), but the payoffs are remarkable. You’ll show up higher in search engines, get questions/comments from people you didn’t know were looking at your Web site and have the opportunity to impress your prospective employers with your latest thoughts. You also can’t just be a writer. Even though modern blog tools make it easy to get by without much design knowledge, having a basic understanding of HTML and how the Web works will go a long way in making things better. Networking is huge too. I attended blog conferences like BlogHer and Blog Business Summit and met lots of amazing folks, one of whom recommended me for this very job. Want more? Read the whole profile here. Blogging for a living sounds like fun! Though I only write the occasional blog I can read them until they are coming out of my ears. This is the exact road that I have been consciously trying to take, especially with learning html. There’s not much point in trying to make a living online and not understanding how the internet works. What a great post! I just found your blog! And I’m so happy I did. Thanks for the great, practical info.